In the past, when I purchased a new bottle of nail polish, I envisioned cheerful pops of color on my fingernails and toenails. 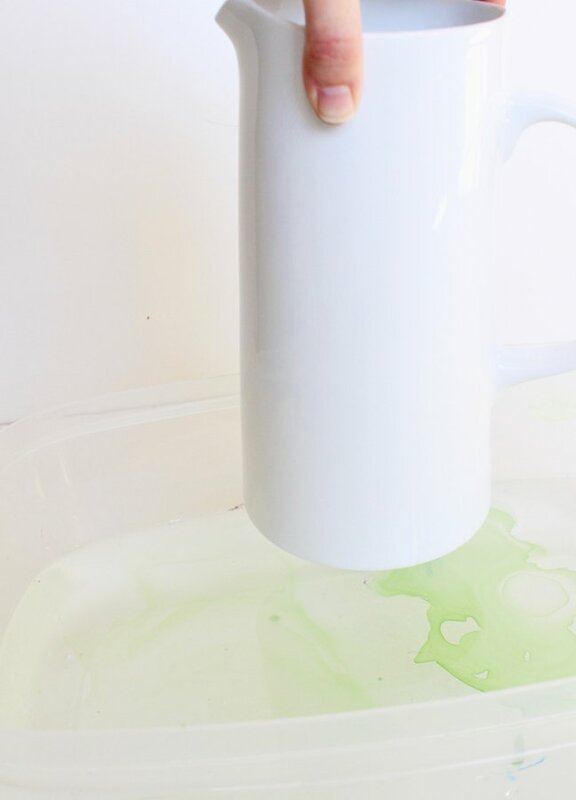 With all the amazing DIY nail polish projects I’ve seen online lately, the world of nail polish has opened up to so many new colorful possibilities. Now when I shop for nail polish, I often think about the colors that would look best on mugs, vases, keys, coasters, jewelry, and trays. 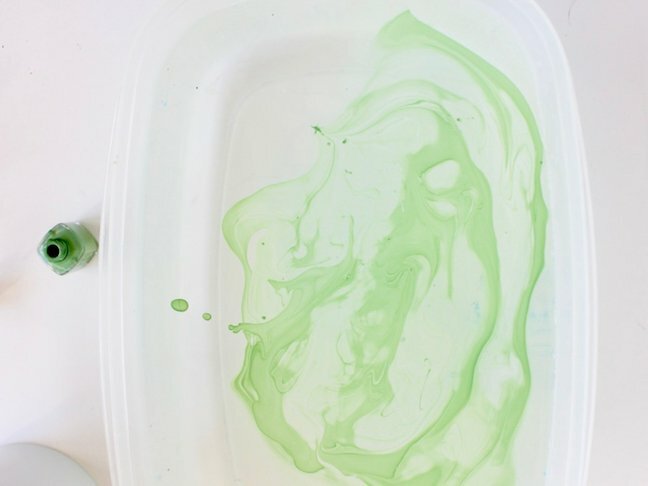 My favorite DIY project to do with nail polish is marbling. Every item is unique because marbling patterns turn out different with every “dip”. 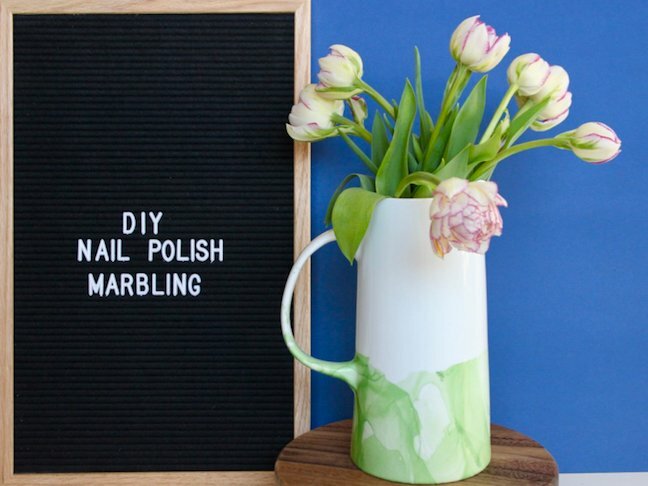 If you’re new to marbling with nail polish, it could take you a couple of attempts to get it right (that was the case for me). 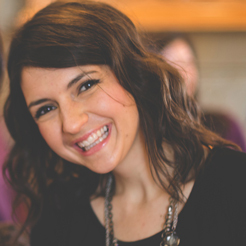 Just make sure you have a bottle of nail polish remover close by. 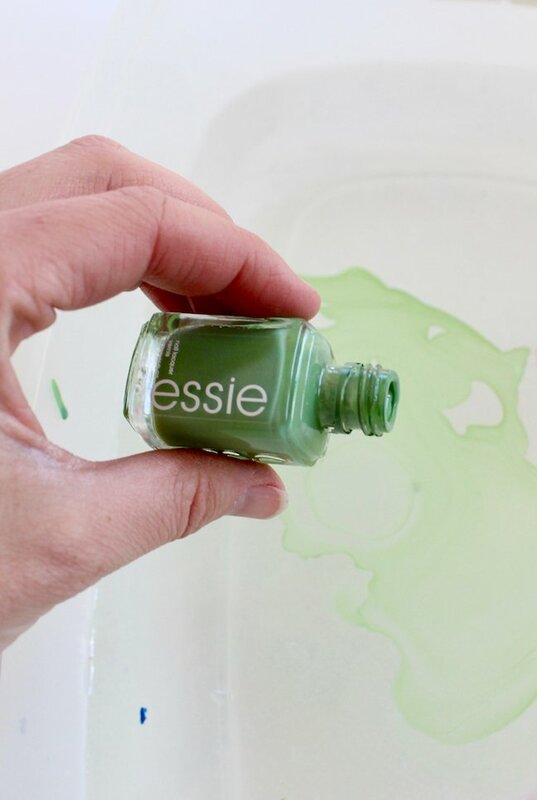 If you’re a pro at this technique, I hope you’re inspired to dip another item in swirled nail polish this weekend. 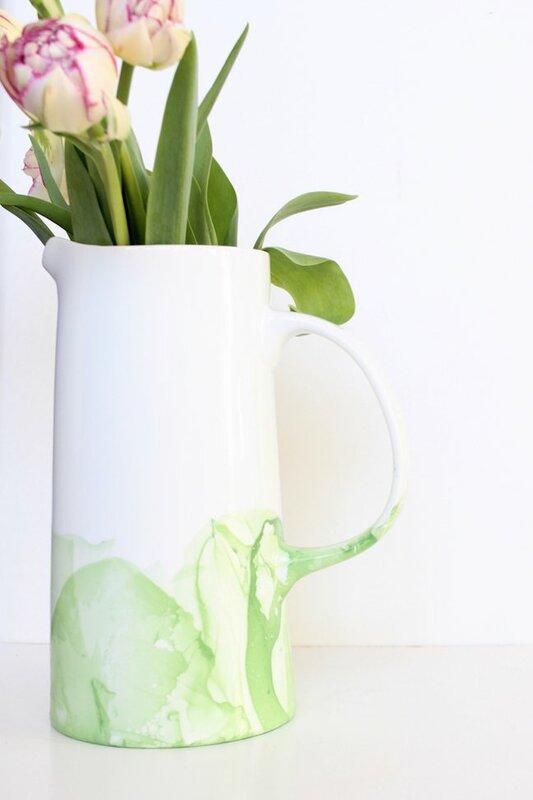 Here’s how I made this chic DIY marbled vase. 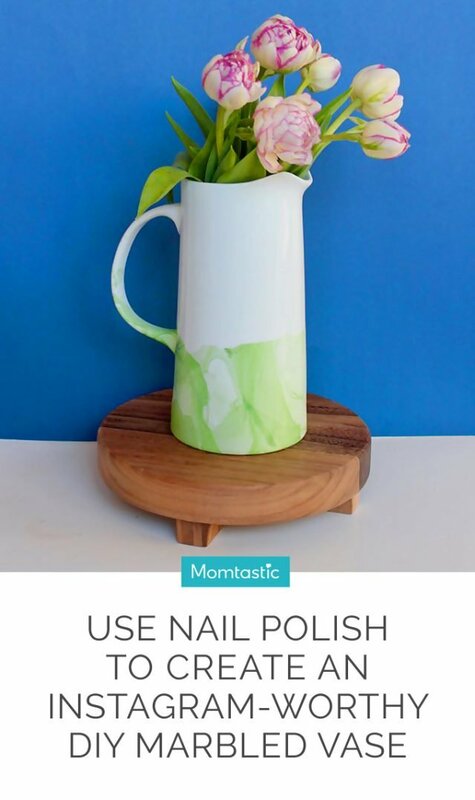 Not only do I use it to display beautiful blooms, but also as a pitcher—the color of the Essie nail polish I used is Mojito Madness, so it gives me a great excuse to serve some mojito cocktails. Step 1: Gather materials, and fill the disposable container ¾ full with warm water. 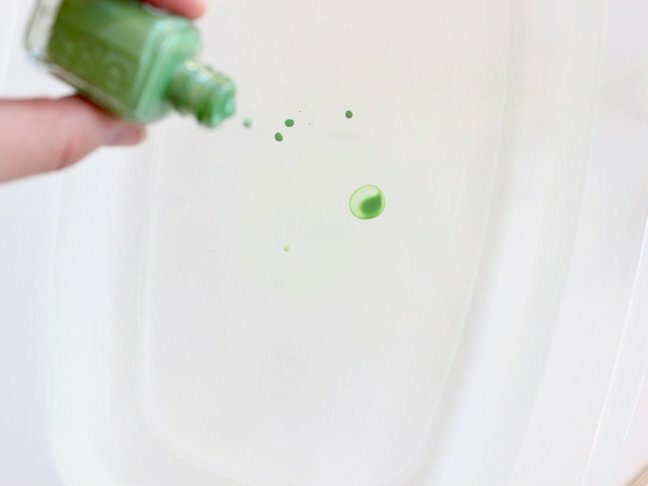 Step 2: Drop nail polish in the water directly from the bottle. Hold the bottle close to the water as you do this (you don’t need to drop it a foot above the water). In my experience, it’s best to use no more than three nail polish colors. For this project, I just used one color. 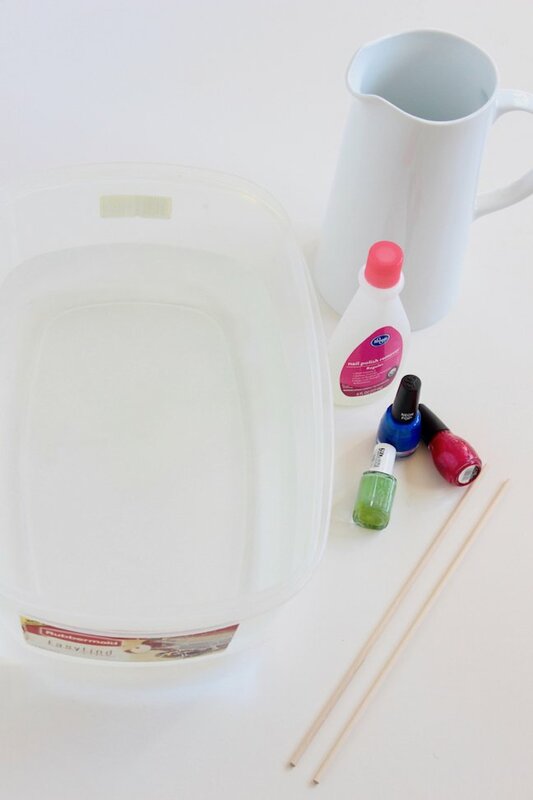 Use the toothpick or skewer to swirl the polish. 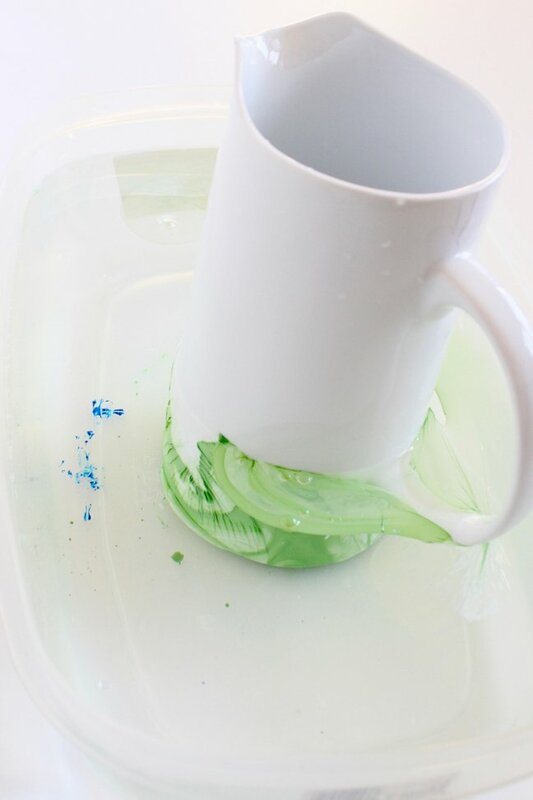 Step 3: Immediately dip the vase in the water.It’s important to do steps 2 and 3 quickly because the nail polish will dry if you wait too long. I dunked the bottom of the vase directly in the water, but you can angle the vase however you want. 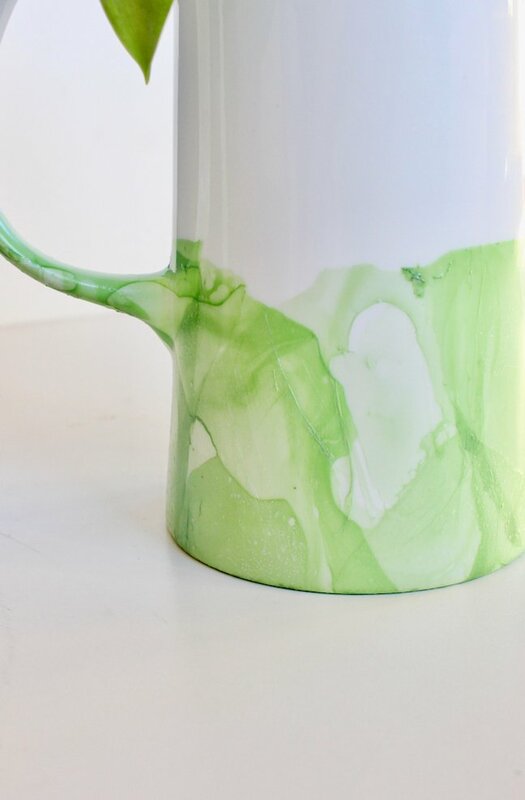 The nail polish will “stick” to the pitcher, and when you pull it out, you will see a beautiful pattern. If there is a spot that didn’t work for some reason, dip cotton swabs or cotton pads in nail polish remover, wipe the area, and try again. 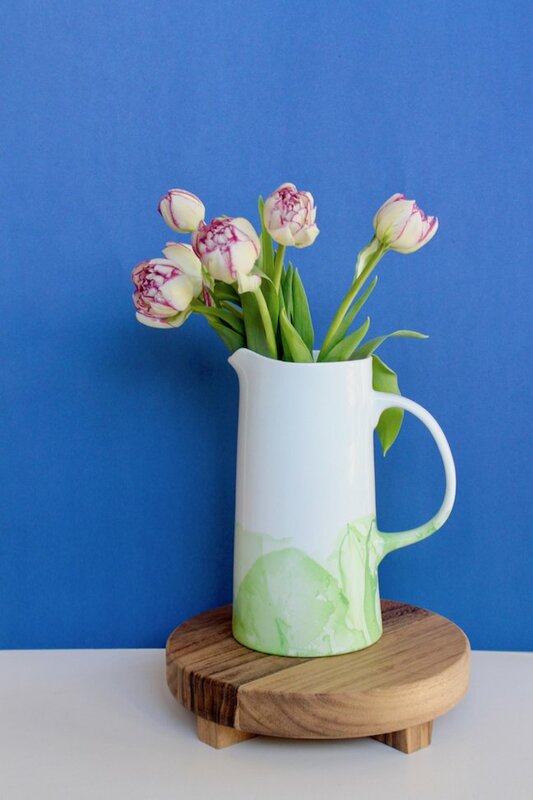 I wiped the entire vase clean after the first dip because the pattern was all wrong, and I waited too long to dip the vase. Step 4: Set aside to dry. You can also gently pat it to dry. 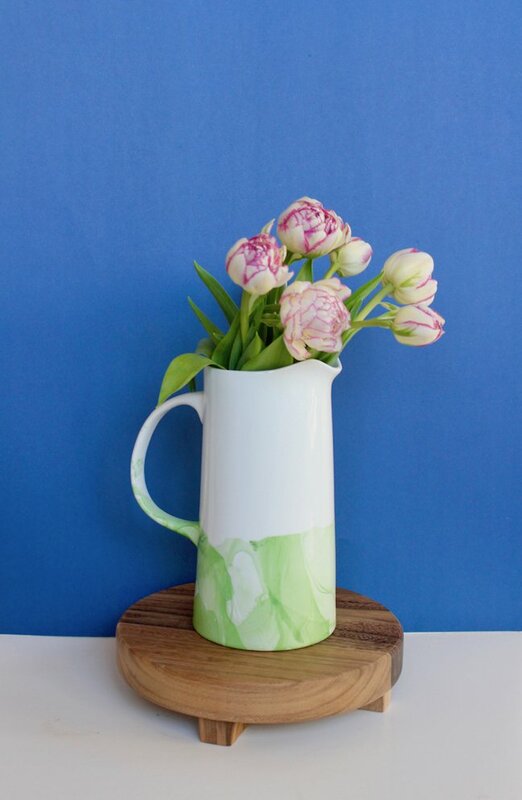 Hand wash the vase after use.